Since leaving college, Jubilee Hamilton has focused on building her career as a political campaign manager. When her most recent boyfriend moved out because she had no time to be part of a couple, she hardly missed him. But when her candidate loses the election, the third such loss in Jubilee’s career, she knows that she has hit a dead end. Without career demands to fill her life, she realizes how little she has to show for her twenty-six years. No one in Washington is calling her, she is semi-estranged from her family among whom she has always felt like an outsider, and she has no friends. 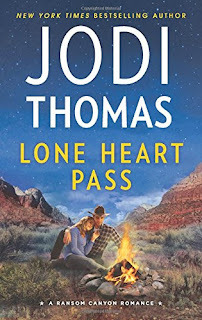 Her happiest memories are of a summer spent with her great-grandfather on his ranch, so when she learns that Grandpa Levy has died and left Lone Heart Ranch to her, she sets out for Crossroads, Texas. Charley Collins expected to spend his life managing the Texas land that had been in his family for generations, but one foolish choice led to his wealthy father’s disowning him. With his credit cards cancelled and all money, including tuition payment, cut off, Charley is forced to drop out of college one semester shy of his degree. A single father, he supports himself and his five-year-old daughter Lillie, by a variety of day work and weekend bartending. The latter pays poorly, but it provides the small apartment where he and Lillie live. Charley is running low on hope when Levy Hamilton’s big-city granddaughter offers him a job as foreman for Lone Heart Ranch. He seizes the chance to do work he loves and also to save to buy land of his own in a year or so. Jubilee and Charley begin as strangers wary of one another and gradually become colleagues with a common cause and then friends. Love catches them unaware, bringing with it more happiness than they dreamed possible and the family for which their hearts long. Part of the joy of the world Thomas creates is that even the minor characters have a presence and an individual identity. This is true of Charley’s daughter Lillie and of Thatcher Jones, a fourteen-year-old who is part eccentric, part philosopher, and part typical adolescent male. He becomes the fourth member of the family Jubilee and Charley create. Lone Heart Pass is the third novel in Thomas’s Ransom Canyon series, and she does her usual superb job of crafting a compelling story filled with characters who engage readers’ interest and affection. Nobody is better than Thomas at providing credible HEAs for misfits and outsiders. Jubilee and Charley don’t fit the molds of typical romance heroine and hero, but they have an authenticity and courage that endears them to the reader. Their difference is a cause for celebration. I was invested from early in the story in seeing these two find their way to an HEA. Each book in this series has drawn me more deeply into the world of Ransom Canyon, and each visit to that world has been rewarding. I thoroughly enjoyed this book, and I am already eager to read Sunrise Crossing, the next book in the series (an August 30 release). If you like contemporary romance with a Texas accent, a richly textured community, and lead characters who will claim a place in your heart and in your memory, add this one to your must-read list for May. Thank you for the review. I have read a few of Jodi's books and loved everyone of them. I have several of her books in my TBR Mountain, including one in the Ransom Canyon series. I really need to get to them and this one is a definite for future reading. Nice to "see" you, librarypat! I too have enjoyed her stories and need to catch up on some - thanks for the review. I enjoy her books too, catslady but I haven't started this series yet. I have never read her but am looking forward to reading her books. She has some wonderful books, Pamela. Both historical and contemporary! Thanks for the comments, y'all. I'm not as captivated by the Ransom Canyon books as I was by the Harmony series, but it is still a great series. Jodi Thomas is a gifted storyteller. Thanks for the review, Janga! I agree with you. Thomas is one very gifted storyteller. I'm listening to Harmony at the moment! I think I'm going to have to FORCE myself to swap in another author for a few days, before I overdo it, but I love it. Just the right balance of action and Texan accented slow-moving country life. What you say about Jodi Thomas's characters being misfits and outsiders is so true. As usual, you hit the nail on the head! This is another book to savor. I always want to read Ms. Thomas's stories right away but love to anticipate them instead. Well, I held off for a couple of weeks but could wait no longer. Now, a few hours later I am finished. Now I am happy and sad. Loved the book but didn't want it to end. What a great dilemma to have. Enjoy. Meanwhile, I am awaiting the next one.